Cincinnati is hip according to Hip Green Scene, a web-based travel guide that promotes “hip” local areas to visit. The site has a feature story on visiting Cincinnati and cites the underground brewery tours, Night Owl Market and City Flea as just a few of the fun “hip” things to do. The website also loves Bakerfield OTR (as does this blogger – yum! yum!) for its fabulous tacos. This monthly outdoor flea market is so much fun. Go to Washington Park in Over-the-Rhine and you will find anything and everything – from vintage items to crafts to plants to food and so much more. Enjoy the beauty of the park and have fun shopping. This blogger is definitely doing a brewery tour this summer. It has been rated as one of the top 3 local tours for CityBeat’s Best of Cincinnati. There are two 1.5 hour tours to choose from during the warmer months and you get to see a network of underground cellars. Have you ever been to Shake It Records in Northside? It’s a music shop with a focus on Cincinnati musicians. Besides selling cds and records they also have a record label, too. These are only a few of the interesting places and restaurants in Cincinnati that make it so hip. Be sure to read the entire article here because there is information about many fun things to do throughout the entire city. Want to follow Hip Green Scene’s updates? Go here. 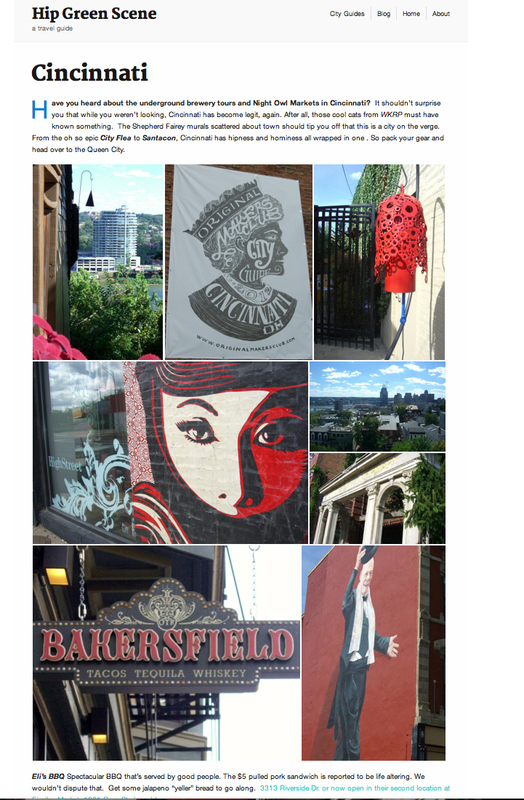 This entry was posted in Communities, News and tagged Bakersfield OTR, Cincinnati is a hip place to visit, City Flea, Night Owl Market, Northside, Over-The-Rhine, Underground Brewery Tours by susanaknabe. Bookmark the permalink.